you have to keep going for the wins until you get them. then it becomes easier. because you did it before. 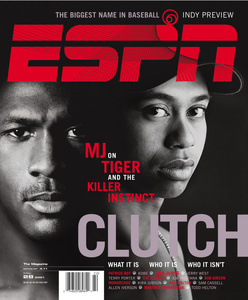 The following is an article from ESPN the Magazine written by Michael Jordan back in May 2001. He talks about Tiger Woods, the killer instinct, and performing in the clutch. When I read this, I find so many similarities to stock trading. I hope that you also see the correlations, as we all strive to become better traders. The ability to perform in the clutch comes from having the confidence to know that you can. Where does that confidence come from? From having done it in the past. Of course, you have to do it that first time, but after that, you’ve got a model you can always relate back to. It gives you comfort doing something you’ve done before.The athlete today with more of that kind of confidence than anyone is Tiger Woods. Look at his record. If he’s got a lead, he keeps it. If he needs a big shot, he makes it. And the more he does it—the more he comes through when he has to—the more confident he is he can do it again.Of course, Tiger’s an athlete for golf, nothing else. I can take him to a basketball court and bet him I can beat him 7 out of 10 times shooting left-handed, and he wouldn’t have a chance. That’s because my confidence is so strong. I wouldn’t feel any pressure.Golf? It’s the other way around. One time we played, he spotted me 5 shots a side. I go out and shoot 75. Guess what he shoots? 65. He didn’t beat me, be he didn’t lose. I’m pretty sure if he’d given me 12 strokes he’d have shot a 63. Fifteen strokes? I don’t know. I think I’d win that bet. But I’m not sure.The key to hitting a golf ball is the same as for shooting a jump shot. You just do something repetitively, until it works consistently. A golf swing or a basketball shot doesn’t have to be technically perfect to work for you. There are guys on the Tour who don’t have perfect swings like Tiger, guys with big loops in their swings, or somebody like Jim Furyk. But their swings work for them.Putting is not too far from a free throw. Just you and the technique. Very comparable. You’re doing something you’ve done a million times before. But you have to block everybody and everything from your mind. If you let yourself think “What if?” as you’re doing it, you won’t.What it gets down to is confidence and pride. Confidence is based on having done it before. Tiger’s confidence is so high because of his work ethic and his past success. And he performs the way he does in the clutch today because he has such confidence. If he wants to hook it around the damn tree, he’ll do it. The rest of us don’t have that confidence, or that past success, so when we hook the stupid ball, it hits the tree.Tiger’s pride is such that he won’t allow himself to be caught off guard. He always has to stay two or three steps ahead of his competitors. That’s why he won’t take a day off. I was that way too. There were days when I didn’t want to work out, practice, whatever, but I did it because I didn’t want that next guy catching me.That’s why, if the game is tied in the last two minutes or down the stretch, I feel I have an advantage over everyone. Tiger feels the same way. But if you fail in the closing minutes, if you’re unable to make the big play, it can work against you in the future. The funny thing is, I don’t remember ever failing. 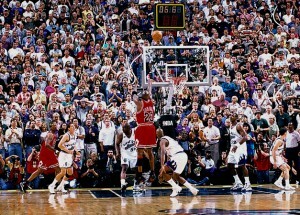 The shot I made to win the NBA Championship against the Jazz in 1998—the shot people think was my last one ever—is probably my best-known clutch moment. But the biggest shot I ever made, the one I always go back to, the one that started it all, was in the NCAA Finals in 1982. The game-winner against Georgetown. And the truth is, I didn’t realize the magnitude of taking it, because I’d never had the experience before. You see, I’d never taken the big shot. High school? Shoot, my team never got out of the sectionals. I can’t remember any really big shots or big plays early in my career. None. The only thing that was close was in the 1981 McDonald’s All-American Game at Wichita State, when I think I made a late steal or a free throw to win. But I don’t put that on the same page with real clutch.In that Georgetown game, I had no time to think. The play was designed for James Worthy, not me. We’d called time-out and Coach Smith said, “We’re going to try to get the ball into James. But James, if you can’t get it up, swing it around. Michael should have a wide-open shot.” I knew I was the second option, so it wasn’t as if the weight was on me. By the time the ball got to me, I just had to react. Maybe that helped.If we’d had a different play set up, or if I’d thought about it in the time-out? I don’t know, maybe things would have turned out different. I imagine I would have tried to stay calm and say to myself, “Hey Mike, it’s not the end of life,” and hope for the best. I know that at really clutch times, some people try to con themselves into thinking none of it matters. But I also know that’s just a rationalization, because it does matter.My whole NBA career I always thought back on 1982. I’m not saying you can’t be confident in the clutch if you’ve never made the big play before—obviously, I was already confident before that shot. But that one moment initiated so much. Every shot after that, I felt I could make. I responded so well in those situations because I had such positive thoughts. I thrived on last-second shots. It became a trait for me.Against Cleveland in the playoffs in 1989, we could have finished the first round in Game 4, but I missed a free throw with nine seconds left. Now everybody expected us to lose Game 5 and the series. But all I wanted was another opportunity, and when we had the chance to finish them off, I did, hitting that shot over Craig Ehlo. Why did I miss that free throw in the first place? I think I didn’t focus. I may have let negative thoughts creep in. It’s not the only time I didn’t come through. 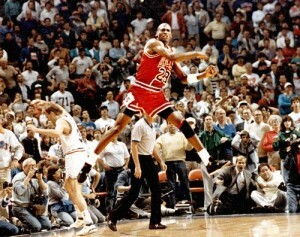 In Game 1 against the Lakers in the 1991 Finals, our first title year, we fought back to go up by two. Then Sam Perkins hit a three-pointer to put them up by one. I took what I knew was the game-winning shot—I was sure I made it, but it went in and out. It’s in the IMAX movie. The shot goes all the way down and then comes out. We lost Game 1 but swept the next four. Why did the shot come out? It wasn’t meant to be.What happens to clutch guys in the big moments is that everything slows down. You have time to evaluate the situation, and you can clearly see every move you need to make. You’re in the moment, in complete control. It’s hard to get there, something has to have you thinking that you can do no wrong. But once you do get there, you can just come out at the start of a game and generate the feeling.Being the best means winning. In college, I never averaged more than 20 points a game. If I got hot, the other team would go to a zone and take away my individual performance. But we’d find a way to win, so who cares?So many young kids in the NBA don’t think that way. Now, as the Wizards president, when I look at some of the young guys out there, I’m not sure I’d draft them, because they haven’t developed that winning attitude. A kid like Kobe? In hindsight, yeah, I’d take him. But when he first came out, I can’t say that I would have.If we have the first pick this year, I may trade it instead of running the risk with some kid who still needs so much more education, so much more experience. There are no shortcuts. You can’t just “think” you can be clutch.My comeback…well, it may not even be a comeback. But here’s the thing: You’re a great player, you’re going to play the game you love—somewhere, somehow. I know the media isn’t going to leave me alone until I decide about my comeback. But for now, right now, I wish that kid Tiger would keep everybody off my back.Just watch him win.